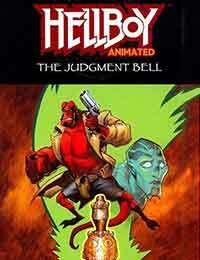 Hellboy Animated: The Judgment Bell Average 0.00/5 - out of 0 total votes. In The Judgment Bell, written by Jim Pascoe (Kim Possible, Buffy the Vampire Slayer) and drawn by Rick Lacy (Venture Brothers), a figure from Dr. Brooms past wreaks havoc on the children of a small Polish village. And in a backup story written and drawn by Hellboy Animated creator Tad Stones, a young Hellboy is once again stirred to heroism by the radio adventures of Lobster Johnson. With a cover by Eisner award-winning Goon creator Eric Powell and an original pinup by Hellboy creator Mike Mignola, this book is the perfect bridge between the comics and cartoon worlds of the Worlds Greatest Paranormal Detective.